A Mini Hand Pallet Jack Truck is an asset to a variety of manufacturing and shipping facilities. Its robust construction minimizes manual labor by allowing the user to comfortably and easily transfer goods and products. This unit is lightweight, making it simple for portability and compact enough to reduce storage space when not in use. It offers a smooth finish for simple cleaning and handling during use. Service range: 3-3/8" to 7-7/8"
Uniform capacity is 1,100 lbs. Lo-Profile pallet jacks come with a capacity of 4400 pounds and a lowered fork height of 2 inches. Haul pallets over rough ground where no ordinary pallet jack can go with this unique pallet jack. 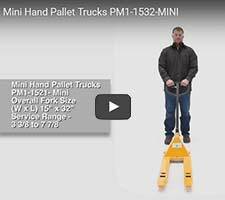 Our Mini Hand Pallet Jack is lightweight and compact for easy use and storage.